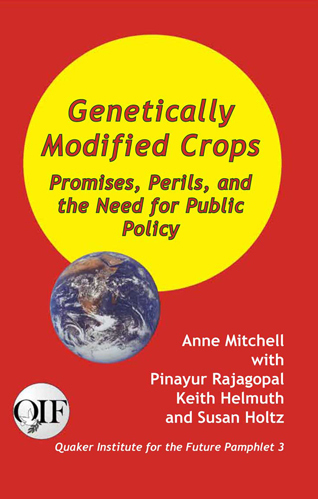 Genetically Modified Crops Promises, Perils, and the Need for Public Policy was written by Anne Mitchell with Pinayur Rajagopal, Keith Helmuth, and Susan Holtz, and published for Quaker Institute for the Future by Producciones de la Hamaca, Caye Caulker, BELIZE - 80 pages (2009). A conflict over the future control of food is now coming into prominence worldwide. On the one hand, large agri-business corporations are focused on using genetically modified (GM) crops as the only way to feed the world. On the other, there are those who see a vast potential to increase the food production capacity of small-scale farmers worldwide through the science-based implementation of eco-agriculture. Both biotechnology-dependent agriculture and organic eco-agriculture have now been in the field long enough that comparative results are being compiled. This pamphlet assesses the record of GM crops and the role of public policy in their regulation. It places biotechnology within an ethical context of concern for equity, the environment, and the common good. It presents a framework for understanding the varieties of biotechnologies and for gauging strategic action on public policy. The unimpeded acceptance of GM food crops has hit several snags: 1) consumer rejection in some regions of the world; 2) public policy intervention; and 3) field experience with GM crops falling short of test projections. The steady march to a corporate-controlled, global-market food system is now being called into question. Safety, health, equity, ethics, and environmental concerns are food system issues in every society. This pamphlet is a short guide to these issues and the way they are becoming increasingly contested. It will be helpful for understanding biotechnology issues and for guidance on engaging these issues at the level of public policy for the common good.